Loki's Castle, a hydrothermal vent field along the Arctic Mid-Ocean Ridge. As the spacecraft Cassini flew past Saturn's icy moon Enceladus, the orbiter detected molecular hydrogen, a finding announced Thursday. It's a nifty discovery, hinting that heated vents beneath Enceladus's oceans may have the right conditions for life. We didn't find any actual evidence of extraterrestrial organisms, though, despite NASA's cryptic news conference tease. But! We don't have to travel far for an example of stumbling upon strange and unexpected creatures in a deep sea: only back to the 1970s, when humans met a cluster of giant tubeworms. These worms, according to the science of the time, had no business wriggling their red tentacles 8,000 feet under the ocean surface. A small group of geologists had ventured 400 miles off the coast of Ecuador to scour the depths of the Pacific Ocean, looking for piping hot deep-sea vents. Scientists predicted that these hydrothermal vents should exist. Nobody had seen a vent before, until oceanographer Jack Corliss peered out the porthole of Alvin, one the world's first deep-sea submersibles. Corliss also saw the worms. He was no biologist. The oceanographer phoned up to the surface, where Kathy Crane, then a graduate student at the Scripps Institution of Oceanography, was controlling the sub from the catamaran Lulu. "Isn't the deep ocean supposed to be like a desert?" Corliss asked. "Well, there's all these animals down here." "Some people would claim that this was one of the greatest biological discoveries of the last century," Edith Widder, a deep-sea scientist and founder of the Ocean Research & Conservation Association, told The Washington Post. The explorers aboard Alvin were nearly a mile below the ocean's midnight zone - the point at which sunlight no longer penetrates water and photosynthesis is impossible. A process called chemosynthesis was the key to life in this Stygian seascape. "Chemosynthesis is often called dark energy, in analogy to photosynthesis which is energy from the sun," said Nicole Dubilier, director of the Max Planck Institute for Marine Microbiology. Plants and other photosynthetic organisms rely on solar energy to fuel a reaction between carbon dioxide and water, yielding sugar and oxygen. Chemosynthesis works in a similar manner, substituting chemical nutrients for light. In the inky depths of the sea, bacteria soak up particles spewed by hydrothermal vents. Near the Pacific "black smokers" found in the 1970s, which belch up thick plumes, microbes can turn compounds such as hydrogen sulfide into sulfur. The microbes channel the energy released in this chemical reaction to create sugars. In the Atlantic, other bacteria live off methane vents, forming strange yarnlike strands. In every hydrothermal ecosystem, microbes are the foundation. "Only microorganisms can gain energy through chemosynthesis," Dubilier said. "By hooking up with bacteria that can use the 'dark energy' available at hydrothermal vents, animals can thrive." As she and her colleagues wrote in a 2008 review, these tiny organisms support a huge amount of biodiversity, representing at least seven animal phyla. The ecosystems are "natural wonders of the world," said Cindy Lee Van Dover, a deep-sea biologist at Duke University in North Carolina. "We think of them as living libraries, living laboratories." Some 3.77 billion years ago, these churning laboratories may have supported the earliest life on the planet. The world's oldest known fossils were remnants of vent-dwelling microbial colonies, according to Canadian scientists who announced the discovery in March. Swimming along vents today are snails and shrimp swarms, which feast on bacteria. Tubeworms grow in clumps that biologists liken to gardens. The worms Corliss spotted have no digestive guts, instead using their flowerlike tentacles to sweep sulfur compounds inside their bodies. The chemicals end up in the worms' trophosomes, an organ filled with billions and billions of bacterial cells. These chemosynthetic bacteria use up the sulfur, producing nutrients that feed the worms. 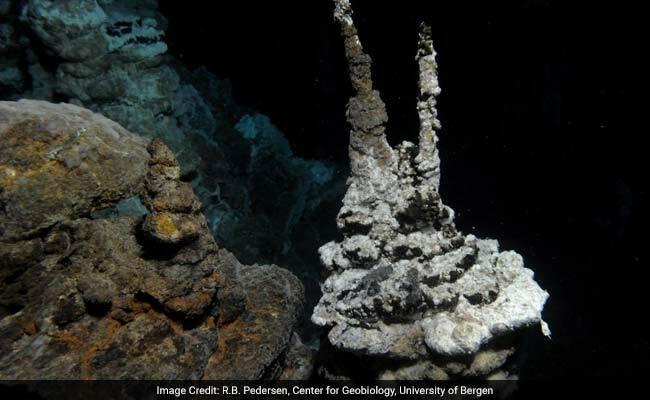 Hydrothermal vents continue to spill new secrets. In June 2016, almost four decades after the scientists aboard Alvin saw the first vents, University of Rhode Island scientists discovered the first bioluminescent organism near a black smoker. Widder, an expert in bioluminescence, says the trick to spotting such animals is to get deep-sea vessels to turn off their lights - which can be a hard sell near vents that eject nearly 700-degree water. Mining companies have also set their sights on the metal-rich areas around the hydrothermal vents. No corporation yet has permission to mine in international waters, Van Dover said. But Nautilus Minerals, a Canadian mining company, has embarked on a project called Solwara 1 to extract copper and gold off Papua New Guinea, a mile below the surface. "I don't advocate one way or another about mining," Van Dover said. Rather, her research involves weighing options - "why we would mine," she said, "and why we wouldn't." Humans need resources that the deep sea could provide. Van Dover pointed out that, like many people, she owns a cellphone, which requires rare metals to function. Deep-sea mining, though, raises several environmental questions. "What are you going to do with the wastewater?" she said. Van Dover described vent ecosystems as "robust," but deep-sea conservationists do not yet know what the cumulative impact of mining might be on these habitats. One fear is that the ocean will lose something humans never knew existed. The worms that lack digestive tracts are something of a biological marvel, among the seafloor's oddest animals. Was it just luck, Van Dover wondered, that these creatures happened to live near the first hydrothermal vents humans ever encountered? Put another way: Is there something out there, skittering beneath a cloud of black smoke, that's stranger still?